We’ve prepared a step by step guide to help you fix Samsung Galaxy S9 is not recognized by your computer. This is a common error and we have seen this same error with many smartphones. Every now and then we have to connect our device to our PC. In order to move and manage our important files, but sometimes we start facing device is not recognized by your computer. There can be many reasons, we have addressed all basic solutions below which can be very helpful. Both the Galaxy S9 and S9 Plus come with incredible cameras. The Galaxy S9 has a single shooter at its back and the Galaxy S9 Plus has a dual shooter with dual-aperture mode and dual-OIS. The Galaxy S9 has a screen of 5.8-inch and the S9 Plus has a screen of 6.2-inch. Galaxy S9 comes with a 3000 mAh battery and the bigger variant has a 3500 mAh battery. Now let’s start the troubleshooting to help you with Galaxy S9 is not recognized by your computer. 1.1 Why Galaxy S9 not recognized by your computer? Heed the instructions below to Fix Galaxy S9 is not recognized by the computer problem. You can also check more general guide of Galaxy S9 and S9 Plus below. S9 or S9 Plus Not registered on network error. Galaxy S9 and S9 Plus Official Stock Wallpapers. List of Samsung Galaxy S9 and Galaxy S9 Plus Model Numbers. 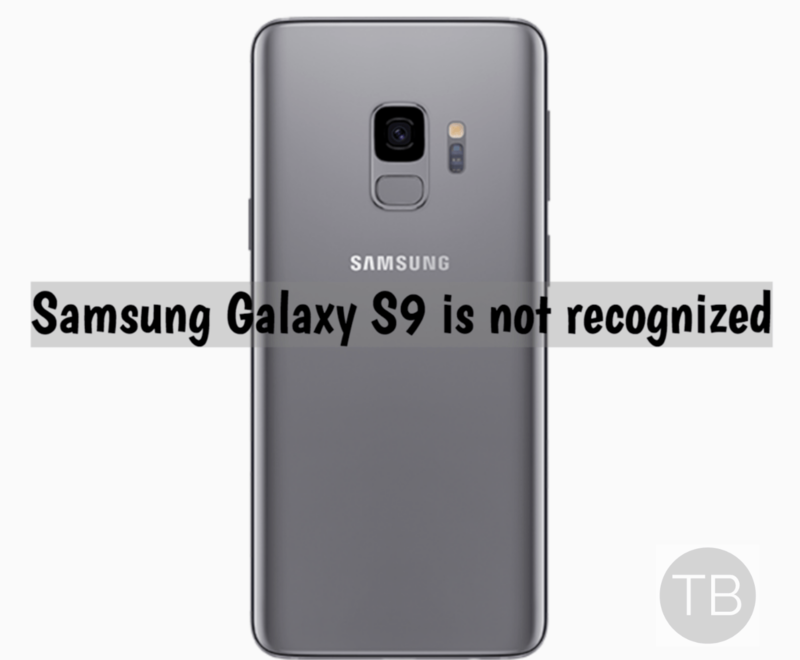 Why Galaxy S9 not recognized by your computer? It can be caused by many reasons. Maybe something is preventing the device and PC to establish a connection. Sometimes your PC is having issues and if not then phone system might get corrupted. If it’s your phone the most likely miscreant apps and firmware glitches are behind all this. However, if it’s from your PC end then it could be missing drivers, and system errors. You can not be specific, that this is the one behind all this fuss. First thing, you should do after failing to connect your Galaxy S9 to your PC, reboot both of your devices. This will help you to get rid of this problem, sometimes a temporary glitch which was preventing your device from establishing a connection. If Reboot doesn’t give it a kick, proceed with the following workarounds. Make sure your device is connected to the computer using the original cable. Swipe down your notification panel and look for USB options. Tap on it to view what else you got. You’ll get different options, try all the options such as ( MTP – PTP ). Both of these options are different and each performs different task. Try changing the USB ports on your PC. If one is not working plug into other. Turn off your Phone and leave it as like for 30 seconds. Turn your device on and plug it back to your PC. If you have installed the USB drivers for the first time. You must reboot your computer. Hold your device firmly, change the position of the cable in different angles. Maybe your USB port on Galaxy S9 is loose and because of that, it could not be able to connect. Download the latest Samsung USB drivers and install them on your computer. Once you’ve installed the USB drivers, connect your device to PC and it would work now. You might need to re-install Samsung USB drivers if they are already installed on your PC. Un-install them first, completely remove all the files and then install USB drivers again. This will help because sometimes your firewall, antivirus, or any other security software is not allowing both devices to connect with each other for security purposes. Turn of all the security software including Firewall and Antivirus. If none of this gave you any hope then I think you should go to the nearest Samsung service center to get it fixed. That’s how you can Fix Samsung Galaxy S9 is not recognized by Computer.